BRIAN produces reports based on performers and/or session label. The Filters tab on the Reports window is used to set these filters. BRIAN will produce session reports based on different combinations of performers. Most times, a report of one artist that includes all sessions between certain dates will be requested. But there may be times where a report of two or more artists can be requested. This section will demonstrate examples of how these combinations can be implemented. The examples show 3 sessions on the dates between April 8, 1957 and April 13, 1957. There is one date with Sinatra as vocalist, one with Lee as vocalist, and one where Lee is the vocalist and Sinatra the conductor. Each example shows the filter settings for the Reports window and the resultant report. Here we want to show a report of any session that has Frank Sinatra OR Peggy Lee. 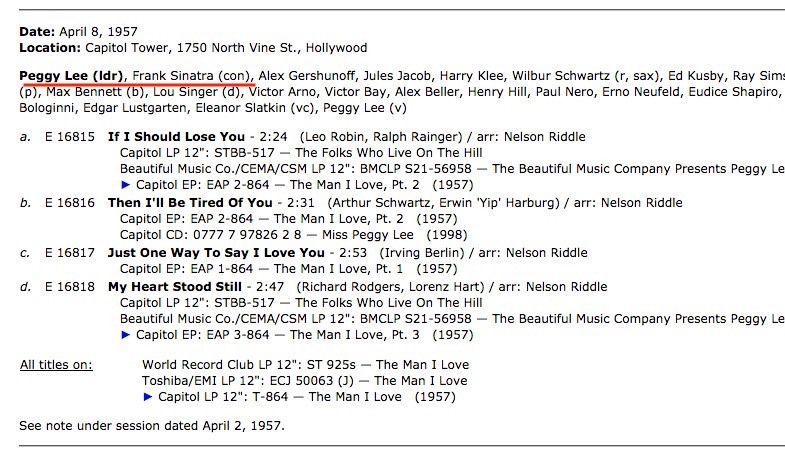 Notice, the first session has both Lee and Sinatra. The second session has Sinatra, but not Lee. 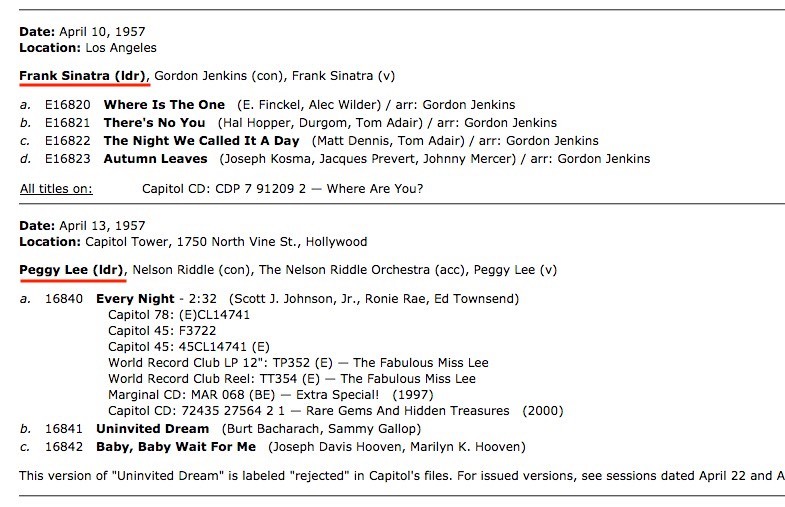 The third session has Lee, but not Sinatra. 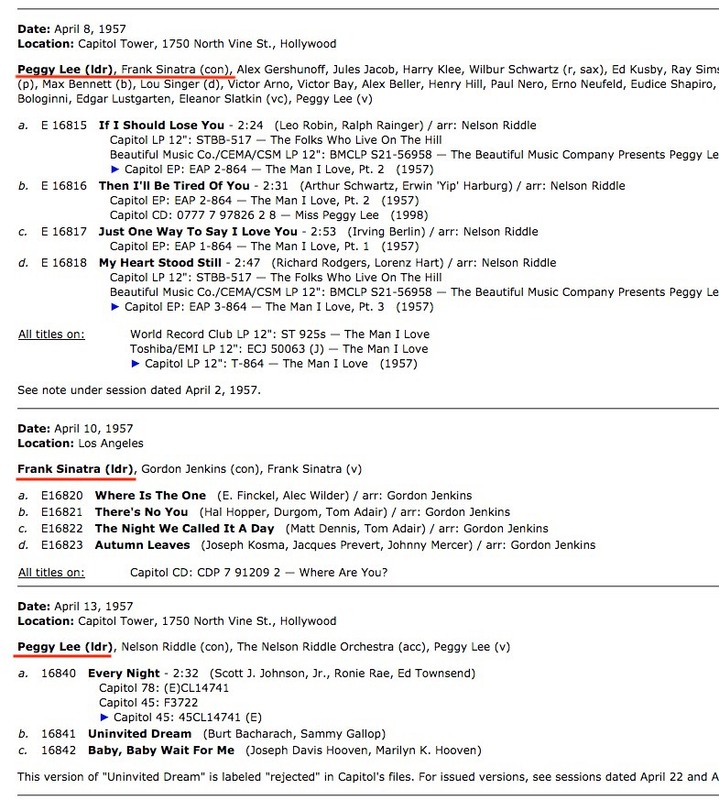 Here we want to show a report of any session that has Frank Sinatra AND Peggy Lee. On this report, we only have the session where Lee is the vocalist, but Sinatra is the conductor. Here we want to show a report of any session that has Frank Sinatra OR Peggy Lee, but we do not want to include Sinatra as conductor. Reports can be filtered by session label with or without filtering by personnel. Bear in mind that session label is not the same as record label. The session label is the label that contracted for the session. The recordings on that session may be reissued on several different labels. for instance, a label like Bear Family or Mosaic will reissue recordings made on other labels. Using Bear Family or Mosaic in the session label filter will not find any sessions because those labels would not have contracted any of those sessions. Unlike personnel filtering, only one label can be specified as a filter. Also, there is no option for exclusions. i.e. there can be no filtering if NOT a designated label. A report can be filtered by performer and label. The filtering will work just as described in the personnel filtering section but with an added filter of session label.